July 23, 2017: Today my friend Roy Cronacher arrived her in Los Suenos, Costa Rica, after a safe trip from his home in Jackson Hole Wyoming. We had a great dinner at the in “Marina Village” then after I soaked in my Jacuzzi (Hot Tub) went to bed to get rested so we are ready to catch a bunch of Blue Marlin on fly. July 24, 2017: After breakfast and lunch while the crew provisioned and fueled up the vessel “Dragin Fly” we packed our stuff and locked up the condo to head down to the marina. Captain James Smith with mates Berto and Roberto had everything ready with the diesel engines and generator running, the new air conditioning system had the cabin nice and cool as we boarded at 3:00 pm and headed out to sea. After 30 minutes of running we slowed to trolling speed and deployed our teasers. We raised a sailfish at 4:25, it faded away and we never got a shot at that sailfish. Seas are choppy 2 to 4 foot, with clouds and rain. At 6:00 it got too dark to see and we quit fishing. We all had awesome Lasagna for dinner, discussed fly fishing strategy and went to sleep at 8:00 PM. July 25, 2017: Woke up to the smell of fresh brewed Costa Rican coffee, with eggs and sausage cooking around 5:00 AM. Bert deployed our teasers at 5:15 as we trolled toward Blue Marlin Destination-X-#9 (BM-X-9) for 2 ½ hours and arrived at about 7:30 am. 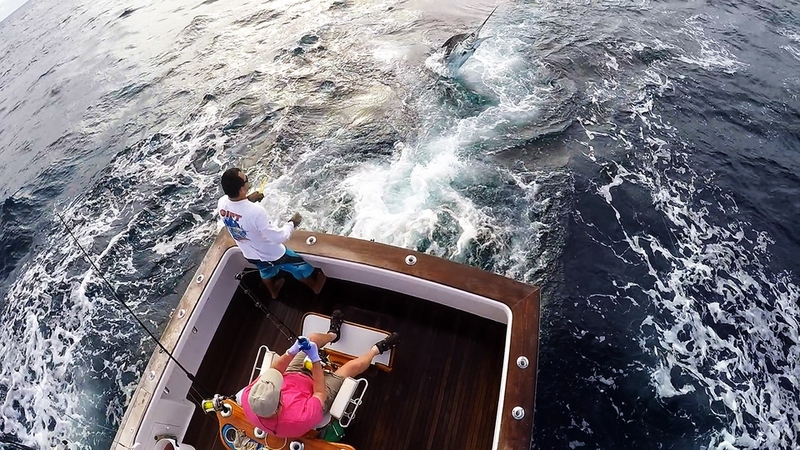 We raised our first Blue at 7:48, it did not bite, then at 7:59 we raised a 250 pound Blue Marlin. Roy made a good cast and that marlin cleared the water as he ate the fly, the fish took off really fast then jumped 13 times as he raced away from the boat. On the 14th jump as we backed up trying to stay with this fish, it chewed through the 100 pound test, bite tippet and was gone. 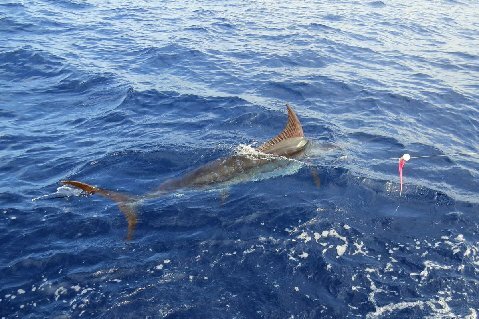 At 8:13 we raised the third marlin of the day; it teased in and looked at Roy’s fly then swam away with no bite. Fishing slowed down after that, then we raised a blue marlin at 10:00, (no bite), another at 11:01 which did not bite. At 11:50 Roy took a break and I was up, at 12:02 a blue came in hot on the long rigger, ate the teaser and jumped as he faded away never got a cast. At 12:51 pm we raised a 200+ pound red hot Blue Marlin on the bridge teaser, I made the cast and that hot marlin climbed all over my pink and white Cam Sigler Fly. At 1:11 Berto retrieved the fly as we released our first Blue Marlin of the day. 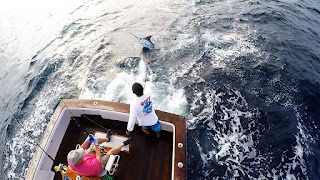 At 1:22 pm Roy cast to a hot 170 pound blue marlin that ate his JJ Marlin tube fly, after a 13 minute battle with lots of awesome jumps, Roy caught and released our second Blue Marlin of the day. 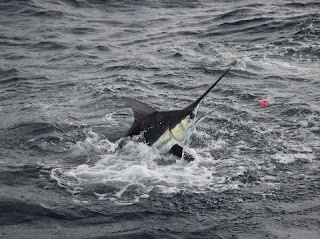 We raised a blue marlin at 2:00, another one at 2:25, and another one (really big, maybe 400 pounds), at 2:38, they came close but would not eat the fly. 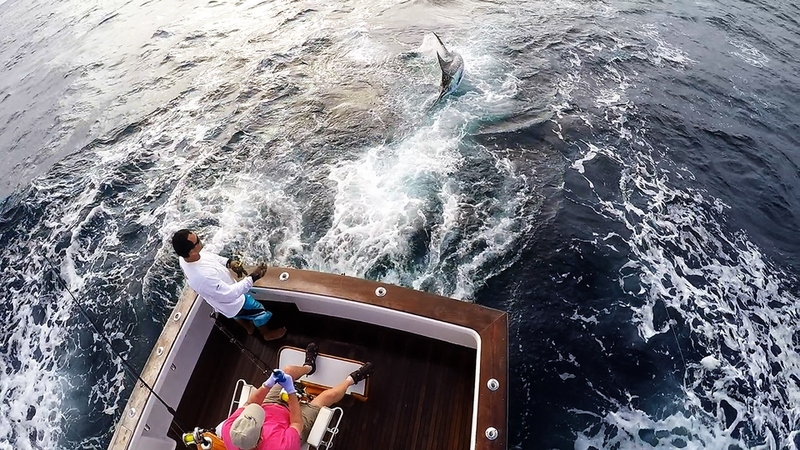 At 5:55 we raised a blue marlin that looked like it was between 300 and 400 pounds, Roy made a good cast and then that big marlin slowly came out of the water and ate the fly. It ran out about 90 foot then went straight down. 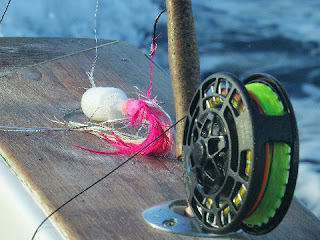 After a couple of minutes the marlin took off at blazing speed and the 20 pound test IGFA class tippet broke as the fish jumped way off of the bow of the boat. At 6:15 we quit fishing and deployed our sea anchor, after a hot shower and clean clothes we settled down in the salon to have our awesome dinner. Our final score today was: 11 blue marlin raised of which 4 ate the fly, Roy and I caught and released 2 Blue Marlin on fly today. At 8:00 we went to sleep. July 26, 2017: Five AM we awoke to the smell of fresh brewed Costa Rican coffee, frying bacon and eggs, while James and Berto retrieved the sea anchor. At 5:15 we were trolling our teasers as we headed back to #9 which was 3 miles away, while we ate breakfast. No fished raised yet, so we put out small cedar plug and caught enough yellow fin tuna to make sushi for lunch, then back to marlin fly fishing at 6:30. 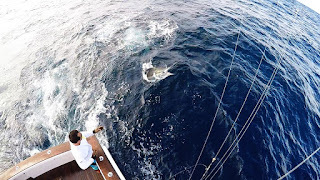 We raised our first marlin of the day at 9:02 it did not bite, the second blue marlin of the day came in hot, looked at the fly then swam away at 9:14 am. We raised another blue marlin at 10:24, it never tried to bite, just swam away slowly, so fat the marlin are very finicky, at 10:44 am another boat near us got the first bite of the day. At 11:01 Roy Cronacher hooked our first bite today, he fought it for 6 minutes as the big fish kept taking line and swimming deeper. 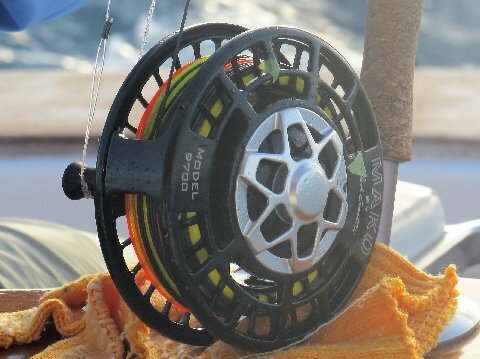 After 6 minutes the 20 pound test class tippet broke and that marlin was gone. 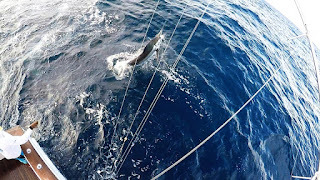 At 11:20 another blue marlin charged the flat line teaser, it came into where the fly was presented, however that blue marlin had a full stomach and would not bite the well placed fly. 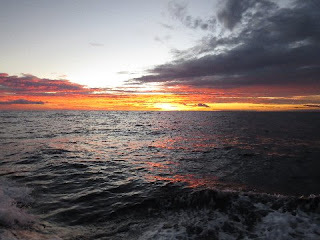 Today has had partly sunny skies with hot weather and 15 knot wind, the sea conditions are moderate chop on top of 3 foot swells 30 seconds apart, overall choppy but comfortable fishing. I hope as I write this at 12:30 pm, just after eating some awesome sashimi yellow fin tuna, that the marlin show up and become more aggressive. At 1:15 James decided to run over to FAD #7, we arrived there at 2:55 pm and started fishing. One of the boats here had raised 12 marlin here in the morning, how the fishing for us seems very slow. It is 5:30 pm and we have not seen any marlin since before noon, one boat caught a fish here about an hour ago, however none for us so far. 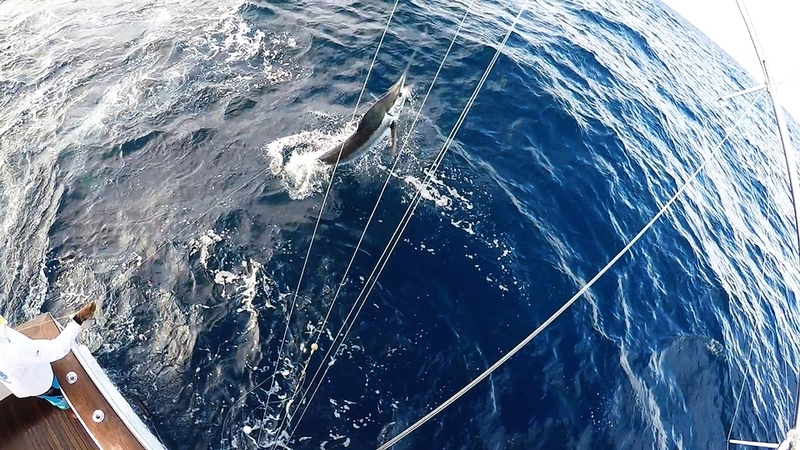 At 6:05 without raising a marlin during the last 6 ½ hours we quit fishing and deployed the sea anchor. After a welcome hot shower, along with a beef loin dinner with beans and rice with strawberry ice cream we went to bed at 7:50 pm. July 27, 2017: I woke up at 4:45 am, got cleaned up helped pull the sea anchor, and discussed with captain James what our strategy for today would be for today. We had drifted 10 miles from BM-X-#7 with the relatively strong current, as we headed back to the Sea Mount, it got light and we deployed our teasers. 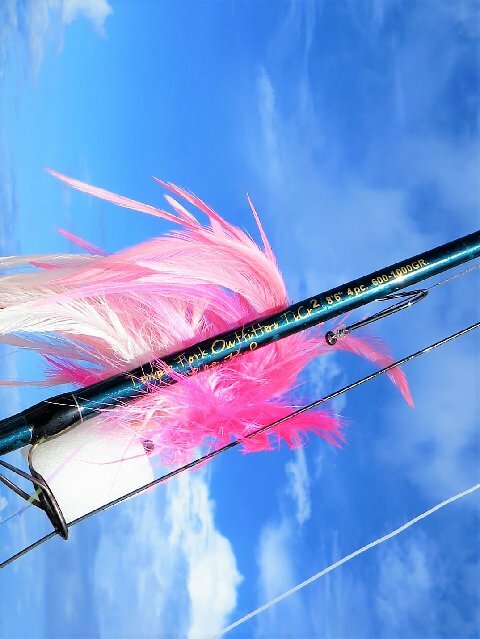 I got the TFO HD Fly-Rod with my Mako #9700 Fly-Reel rigged with a RIO Leviathan 550 gr fly-line ready to cast a pink and white JJ Tube Fly with popper, rigged with 20 pound mason hard class tippet and 100 pound bite tippet and Gamakatsu 8/0 Octopus hooks ready to feed a marlin. 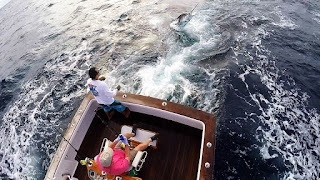 We drank some wonderful Costa Rican coffee and had our sausage with Bacon omelet for breakfast, at 6:20 AM we raised our first blue marlin of the day. The fish came in hot, swam around the fly but would not bite. Then at 7:59 am got to cast to the second marlin of the day, that fish faded off and never saw a fly. At 8:12 am we decided to catch our lunch, fresh yellow fin tuna for sashimi, 10 minutes later we had half a dozen 6 pound tuna to feed us and the crew. Now at 8:25 we are back to work trying to catch some blue marlin on fly. After no fish for a long time, we left at 10:15 and trolled over to FAD #6 arriving at 11:50 still no fish. At 12:15 we raised a double of blue marlin, these fish are really weird, they stay around for a few seconds but will not commit to eating the fly or even trying to eat the teaser. I sure hope they turn on and begin to at least try to eat our flies? 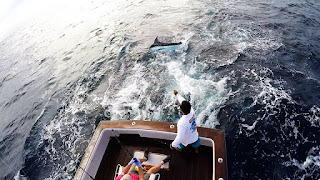 At 12 45: a 150 pound blue marlin charged in after a teaser, Roy made a good cast and hooked that marlin, it stayed up and jumped a lot, then 14 minutes later Roy caught our first blue marlin of the day and the third of our trip so far. At 1:15 another fish came in hot and tried to eat the fly, he missed it and was gone. It is now 5:00 pm, the seas are flat, sunny skies, 83.5 degree water temperature, perfect conditions, we are marking bait and marlin with our electronics, just one hour left of fly fishing today. 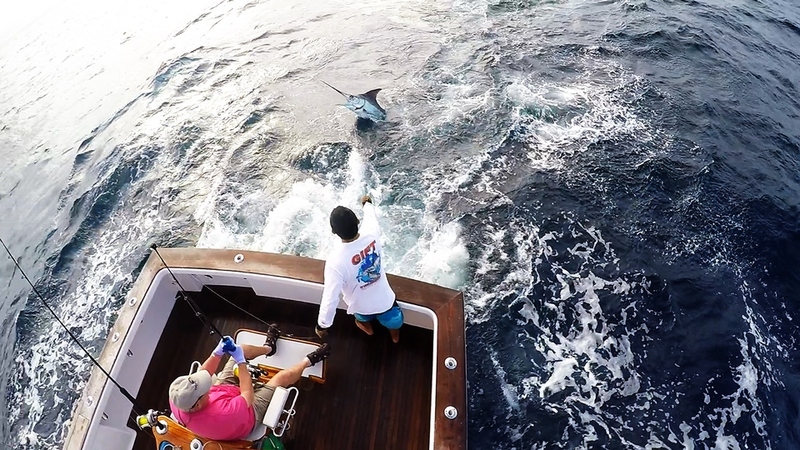 At 6:30 pm we pulled in the teasers and ended Roy’s forth year at my Costa Rica Blue Marlin fly-fishing school. We are just finished with a hot shower and the boys are grilling steaks for dinner. 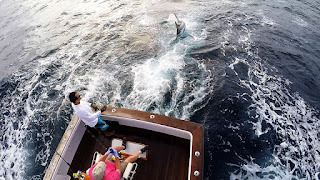 Today we raised six blue marlin, got one of them to bite, and my friend Roy Cronacher caught and released a 150 pound blue marlin on fly on 20 pound class IGFA tippet. 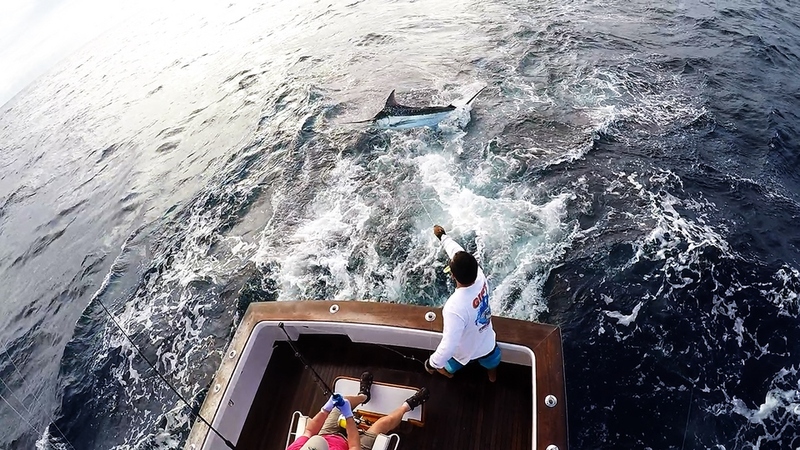 Our total score for this trip aboard “Dragin Fly” out of Los Suenos Costa Rica was as follows: Raised 22 blue marlin, bites 6, caught and released 3 Blue Marlin all on 20 pound class IGFA tippet. 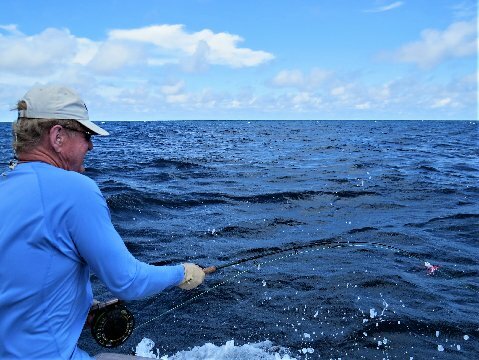 After four trips here with me, Roy has caught 12 Pacific Blue Marlin on fly, (averaged 1 per day of fly fishing). 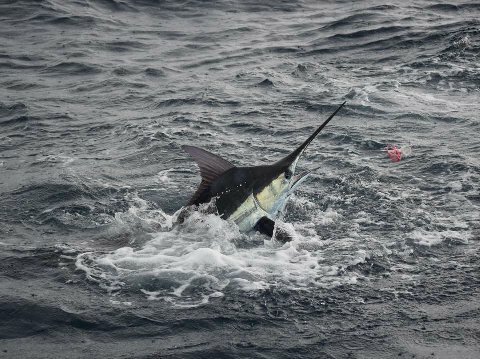 Roy also caught and released his Atlantic Blue Marlin on fly on 20 pound IGFA tippet while fly fishing at my “Dominican Republic Blue and White Marlin School” while fishing with Captain Tim Richardson, aboard the vessel Chaser. 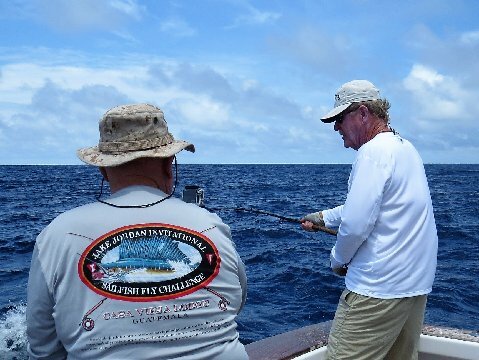 As a long time fly-fisherman who has been chasing billfish on fly for over 40 years, it amazes me how we can fish for 3 days, 13 hours per day, see a total of 22 Blue Marlin, catch three Blue Marlin using full IGFA rules and 20 pound class breaking strength tippet, and now on the way in it feels like it was slow fishing. During my lifetime before 1991, I had fished hundreds of days with fly tackle trying to catch a Blue Marlin on fly. I had hooked 119 in my life, and had never caught one, and then in 1981 I caught a 90 pound Blue on fly in Venezuela. Six years later I caught #2, now on this trip I cast to one Blue Marlin and caught it, this was my 54th Blue Marlin on fly. I love my Job, wish you were here. Stay tuned for more fly fishing reports to follow shortly. Thank you for a GREAT trip!! We smoked em`!! I attached a few pictures. It may be a couple weeks before I can go through all the film but I`ll send you a few more at some point.